I've always had a soft spot for Primarks costume jewellery. As ever, the prices are very reasonable and they offer on trend styles too. 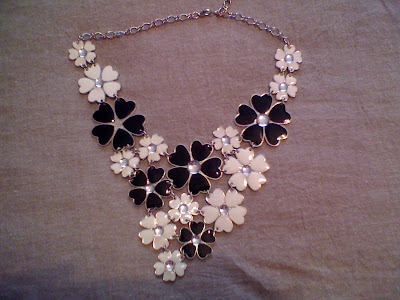 I purchased this black and white enamel floral statement necklace last month for only £6. Wil you be sporting a statement necklace this summer? Oh my gosh..someon gave me a pink flower so much like that one on a key chain for Christmas. Now I wish I could figure out how to put it into a necklace. I did take a heart pin and put it on a chain. I wore it to a party just to find I was over dressed for it. I do love the floral necklaces. I only really wear long necklaces I don't like anything too high up my neck but your choices are so pretty, I know 3 girls who would love them! Great spots in Primark - which I haven't set foot in since my panic attack there last year! They both look great buys. They both look so pretty. I've got a few huge necklaces I've picked up on my travels. My favourite has to be a choker I bougt from a gypsy in India made from old rupee coins and forks, it certainly is a statemnt piece. The enamel piece is fantastic! I love bib-style necklaces. Definitely - all about necklaces, I have tons of old costume pendants which I've picked up from charity shops over the years which I think brightens up any outfit. Wow loving the first necklace, what a statement piece! I'm so bad with jewellery, rarely wear it. But I love cheap costume jewellery - gives me a choice, but I don't feel bad if I forget to put it on (again). Lovely necklace! I love statement necklaces and have quite a few. I think Primark's belts are brilliant too. Hi! Beautiful necklaces! very cool! I love the pink one! I am not a fan of necklaces, but they look so cool!I have quite a few but then I always forget to wear them..
Hi everyone-thanks for all the lovely comments!! I'm still on a search for the definitive summer statement necklace. I had a good mooch around today on a rare child free shopping morning but nothing yet. This does not mean I'll give up! On the plus side I did give my friend her birthday present which was a gorgeous necklace from Warehouse - maybe I'll just go back and get one for me! Love the last. 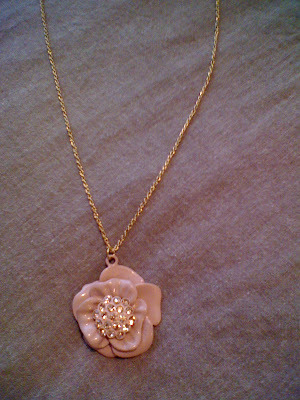 Can't wait to get a big bold flower necklace to wear all summer long. Urban Outfitters are getting in some good ones! Yes, for sure! Love this trend, nice finds. Have a great weekend! Hi ladies-thanks for the lovely comments, as always, much appreciated! !